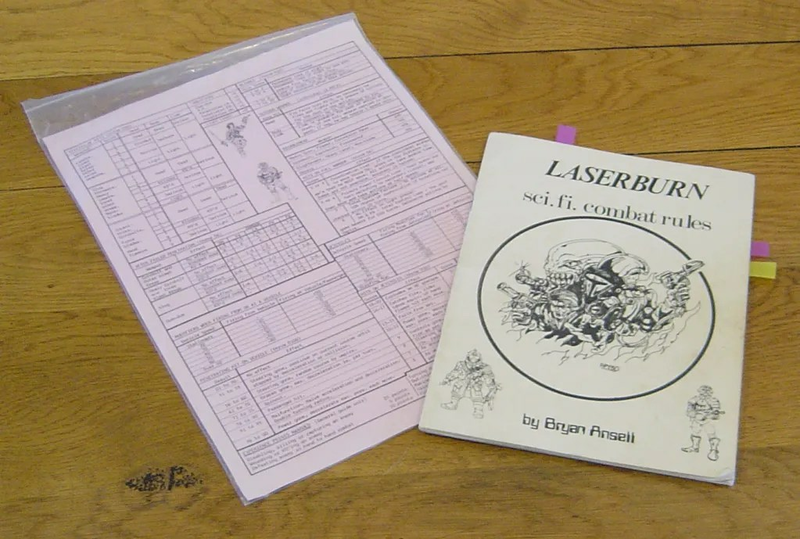 Laserburn is a game I picked up way back in the Golden Age of wargaming, it was written in 1980 by Bryan Ansell and published by Tabletop Games as an A5 b/w booklet. It came with a pink “easy reference” sheet with lots of tables, and another sheet of various blast templates which you had to cut out. A product of its time, it was obviously meant for RPG and skirmish gaming, especially Traveller. It had its own range of miniatures sculpted by Tony Yates, Ali Morrison and Rick Priestly amongst others. Later they produced Imperial Commander, a scaled up version of the game. The game system mostly used d10s and % dice results to resolve to hit and wound results. It also uses d6s for some tables. It is based on 15mm figures, so you lose some of the customisatiuon you can do at 28mm, but opens up opportunities for longer ranged weaponry and lots of vehicles. You can also field a gang or force quite quickly and at a lot less expense. All units/characters take their turn based on Initiative, so it is not an “I Go U Go” (IGUGO) system, and that makes it suitable for multiple sides to play unlike Warhammer and many other games systems. A mechanic I really like and hope to include in games system(s) I write. More importantly, it introduced Bolt Guns, Power weapons and many other staples of what later became Rogue Trader and WH40K. The Imperium of man is described, and the so called Red Redemptionists which would today be the equivalent of either Chaos or the Imperial cultists. As with most of the games of the early to mid 1980’s it encouraged more RPGing and home brew rules. There is a Yahoo! Laserburn newsgroup that is still semi-active and has some more useful documents and scenarios. So its a game that you can use to recreate Bladerunner, Battle Star Galactica or Star Wars if you want and are prepared to do a bit of work. The Ghosts of Mars, Total Recall and others are all sources of inspiration for this game system. There’s a lot of promise in the rule book but it could really do with a revision and include proper rules for vehicles that are only really sketchily covered in the Main and Advanced Rulebooks. The difference from when it was first published and now, is that there are many more producers of 15mm sci-fi figures, especially scenery (says Scenery Boy) such as GZG and Critical Mass Games. Khrurasan also do figures. It was in fact published in 1980, the majority of figures were sculpted by Tony Yates. The other sculpts were integrated from the Asgard ranges. You are quite right about the date. The Ali Morrision and Rick priestly link I picked up on from an interview with Rick somewhere as he made it clear he wasn’t a great sculptor and it wasn’t a lucrative job. Didn’t know Tony Yates did the figs – knew he did the illustrations. Were the ranges TTG or Asgard tho ?